Solar Lighted Two Sided Hanging Address Sign - - three-piece illuminated address system powered by the sun. Consists of a personalized 10" x 6" x 1/8" rectangular house number sign with solar bracket extension and two solar lights. Sign made in USA. Personalized house number plaque holds up to four (4) 4" characters or five (5) 3.5" numbers or characters. Two sided hanging sign. Same personalization appears on both sides. 3/8" hanging holes on 6" centers are reinforced with two solid brass grommets. Ready to hang from your own post. Comfort House recommends the optional Quick Link to secure this sign to your post. Sturdy and UV-stabilized laminated acrylic construction with engraved numbers. 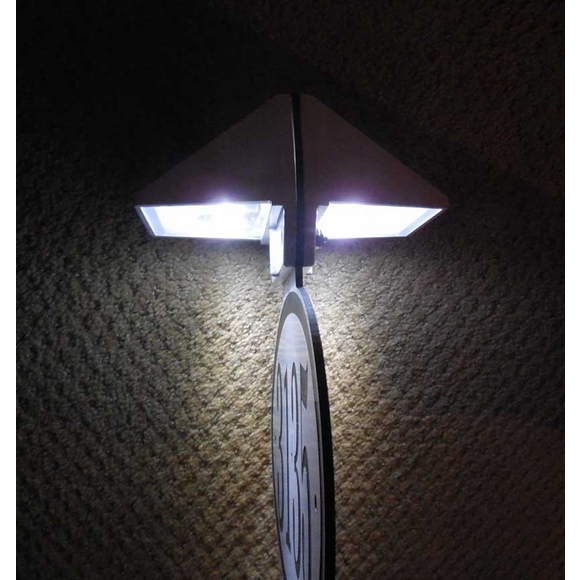 Overall dimensions with solar light: 10"W x 9.25"H x 6.25". The included solar lights illuminate for up to 12 hours per night. Sun recharges internal long life AA Ni-Mh battery (included) during the day. Two high-output LEDs on each side produce brilliant white light. Dimensions: 3.5"W x 3"H x 2.5" deep. Solar Powered Two Sided Hanging Address Sign. Lights up automatically every night.